All these people flocking to the Park began to cause concern to the Sutton Corporation, anxious to preserve the wild loveliness of the Park and the peace of the town. “Notice be given warning parties coming to and returning from Sutton Park against their committing nuisances by waving flags and playing music on the Turnpike Road”, they resolved, to little effect. The Warden and Society finally grasped the nettle on August 19th 1863: “that in order to increase the number and efficiency of the force for maintaining order in the Park and protecting the inhabitants and respectable visitors from the lawless portion of the excursionists the Corporation consider it necessary to impose a payment per head upon all persons entering the Park not being inhabitants”. The entrances to the park were now controlled by gates and ticket offices, and the park was policed by park-keepers. On bank holidays there were often queues to get into the park, the record number of tickets sold in a day being held by Whit Monday 1933, when 51,902 people paid to go in. 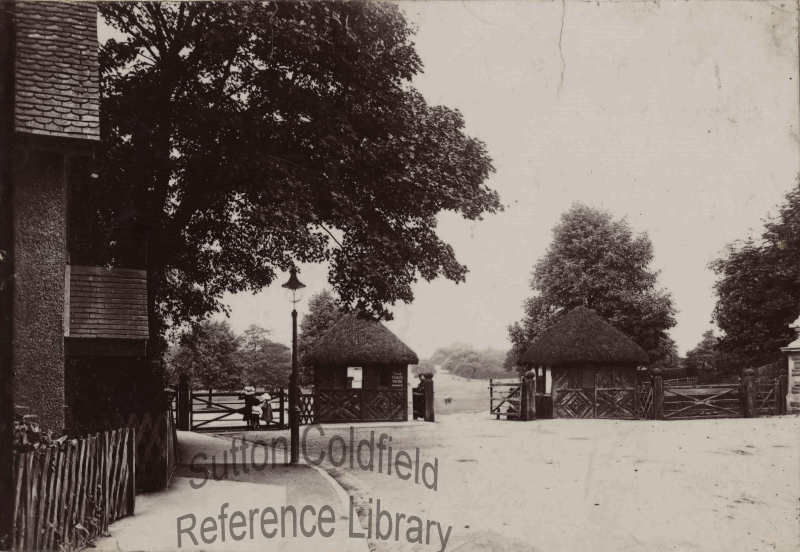 Town Gate in 1900; the notice on the ticket office reads “PARK TICKETS HERE” photo courtesy of Sutton Reference Library.